Just Mobile’s Xtand for iPhone is a high-quality aluminum stand that elegantly and economically houses your iPhone wherever you wish. The design of the stand takes cues from Apple’s iMac stand and has rubber lining on the bottom to maintain a grip to the surface you choose to leave it on. The aluminum is cut with precision and has a very solid feel. The product does not seem cheap, but seems like it was built to last. The stand ships with three essential pieces that you need to assemble. Assembly is very simple as all you have to do is screw the base to actual piece that houses the iPhone. The screw is not like your everyday screw as a screw driver is not needed. The piece that houses the iPhone in the stand uses 4 soft rubber pieces to keep your phone in place. When using the iPhone while it’s in the stand, the stand won’t tip. The experience is great and it’s almost like using a super-mini iMac. The stand can be easily adjusted into portrait or landscape so it is great for watching movies, typing with a keyboard, and especially for FaceTime calls. The Xtand for iPhone is a great iPhone stand as it has fantastic build quality, and simply fits in with the rest of Apple’s products, in terms of industrial design. The stand makes some of the iPhone’s features even easier to use such as FaceTime, watching movies, and viewing photos. 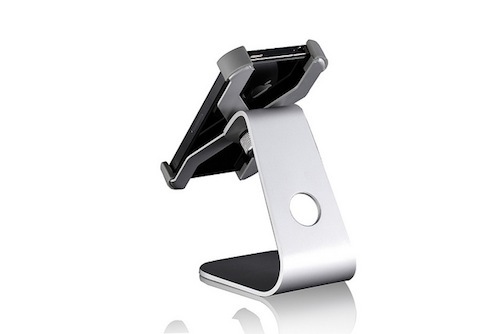 We recommend it for anyone who wants one of the best iPhone stands on the market. You can get one here for all iPhone models at almost 20% off for under $33. Just Mobile even makes an iPod touch version which you can here for the same iPhone discounted price. There is also an Xtand Pro that is built for the MacBook/MacBook Pro at 26% off for under $74. Be sure to check out our Just Mobile Upstand review which is a similar stand for iPad.